I bought an Epiphone Thunderbird and it rocks right out of the box.. Anyone else play one ? Yeah…I've got one and it is the best out-of-the-box I have ever bought. I didn't have to do anything to it, though I did adjust the action a bit. Neck dive and different ergonomics compared to my Fender, but definitely a better bass straight out of the box. 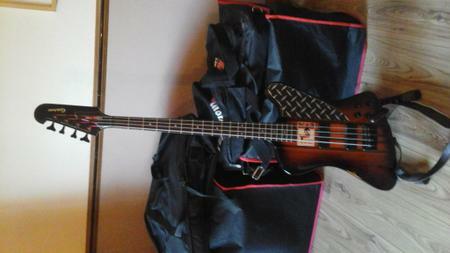 I have the classic-IV pro and it's one of my favorite basses. You can't beat it for quality and price. Anyone got a Gibson Thunderbird? I have the classic pro and it used to dive until I switched to a home-made leather strap. I agree, why Gibson would do such a great job on the Epiphone and then try to sell their own for four times the price is madness. Because people will still buy them anyways. There are a bunch of people who start talking trash just because they see Epiphone on the headstock. The same kind of people who can barely play and rarely practice and are full of parents money to buy expensive gear they cant use to its potential. In today's World, there is really no reason to purchase an expensive bass. Last few years competitors have really done well producing quality instruments. Only reason someone would deliberately buy an American made Fender to the Mexican made Fender for example is purely for bragging rights and nothing more. There's no reason to pay double for something that is not going to produce a better sound. It's too the point now where investing into a quality Amplification System is more important than the bass guitar itself. That is the difference maker, not so much the instrument anymore. There's just so much good stuff to choose from now in bass guitars at a lower to medium cost.